As part of my top 10 acoustic songs series here are my top 10 blues songs for acoustic guitar. Of course this is very subjective and there will be plenty left off this list that others would have on theirs. For the sake of it I have put these in order but that by no means claims that one is better than the other. Each song is unique in its feel and style. O.k. let’s get into the list. Death Letter Blues showcases Son House’s energetic driving rhythm, powerful emotional vocals and his abundant use of slide. Son’s blues development didn’t start until he was 25, in 1927, before which he was a preacher. He has been said to have been a great influence on Robert Johnson and Muddy Waters amongst others. A classic blues number, originally written by Big Joe Williams in 1935. This song has been covered countless times by who knows how many artists. Probably the most popular of which are from Muddy Waters and the more rock influenced version by Van Morrison’s Them in 1964. My favourite version, of those I’ve heard, is the Lightnin Hopkins version. See video below. I admittedly was introduced to this song by what I considered to be an otherwise boring movie. But watching the movie wasn’t a complete waste of time because it did unearth this gem. 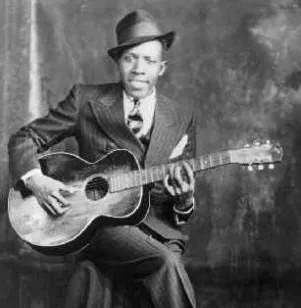 The first of two Robert Johnson numbers on this list, Me and the Devil Blues, is a classic Robert Johnson track illustrating his somewhat haunted and brief existence. A member of the 27 club (died at age 27) his life was shrouded in mystery and there are many stories, the truth of which is hard to know due to his obscurity (he wasn’t a well known or popular artist in his lifetime). But the stories do add to the myth and offer intrigue to the music. Considered to be the father of Delta blues, it’s hard to quantify the influence that Charley Patton has had on music in all corners of blues and rock and beyond. Though not typically known as an acoustic player and seldom seen performing with an acoustic, this acoustic version of Hear my Train a Coming shows the more subtle side of Hendrix’s repertoire. Whilst Blind Blake is, strictly speaking, a rag time artist I don’t forsee a ragtime acoustic guitar top 10 and I wanted to include this extraordinary guitarist in somewhere. And with “blues” in the title of the song it certainly seemed a fitting choice for this list. Like Jimi Hendrix, Muddy Waters isn’t generally known as an acoustic player – but that doesn’t take away his ability on the instrument. The tune in the video below is testament to that. Known for his slide guitar (which is well prevalent in God Moves over the Water) and I guess you could say gospel-blues fusion style, Blind Willie Johnson, like many others of his era it seems, many stories exist but the truth of which are unverified. However, as the name suggests he was blind. Just how he came to be blind is unknown though -although there are some theories surrounding this. And finally we have Robert Johnson’s second entry on the list, Hellhound on my Trail. A haunting tale of running from personal inner turmoil (or at least that’s my take on it!). Or if you’d rather, running from the Hellhounds that were after him after making his deal with the devil at the crossroads in return for success. If that’s the case he got the raw end of the deal as he saw very little success in his lifetime. Only long after his death was Johnson recognized and became known. Thanks for reading my Top 10 blues songs list. Undoubtedly there are many others that belong here but this is what I came up with. What would you include on the list – and what would you remove to make room for it? I’d love to hear your thoughts in the comments section below. Any other comments also more than welcome. Great write up on the top 10 blues songs. It would be very hard for me to narrow down the to a top ten in this category as there are so many of them. Hey Marc – you’re absolutely right – it’s real hard to narrow down the best blues songs and of course their are heaps of great tracks that I left off. Maybe I need to expand to make this like the top 100 acoustic blues songs! Thanks for visiting. I love your article here, although I was hopng to see my favorite song, Summer Time” in your top ten. Even so, you have a very fine list and I think it’s great that you included audio for each of the tittles you selected. Well done. Hey Debra – thanks for reading! Are you referring to summer time by Ella Fitzgerald? What a powerful list of the top 10 Blues songs on acoustic guitar. It just don’t get any better than this. From Robert Johnson to Son House it’s incredibale mohave them all on this list. I would have been hard pressed to put one above the other as a favorite. I got to tell you though my favorites are Charley Patton and Son House. Although I’m not really a Blues player per say, I do love to listen to it and play it. Its incredible the impact these players and the blues have had on our music in general especially here in America. The generation of Blues players that came to be after the ones you have on your list, are up in age now. And we’re loosing them at an alarming rate. As of late and as you know it was BB King. But there are others that are worth mentioning that didn’t have the notoriety as Muddy Waters or BB. They are all Mississippi Delta Blues musicians. Many feel when their gone that will be the end of that era. You can find some info on these players in the Huffington Post and various other articles. Here are their names. If you get anymore info on them please pass it along. Thanks for your input. Definitely agree that there are a lot of great unknown blues musicians out there and I’m keen to learn more about those you have listed here. I thought that Hendrix track might be a controversial one! thanks for the list.. really nice.. I miss Mississippi John Hurt with Coffee Blues.. one of my all time favourites. Thanks for pointing that one out. Another great track from another great blues artist. Would also be hard to choose a favorite of Mississippi John Hurt’s but that’s a good one. Thanks Shambhu! Appreciate it. Anything else you would want in there? Or that you would take out? I didn’t really even think of SRV, just that I associate him more with electric blues but he does of course have an acoustic repertoire too.